Pine Trees And Pearls: What you NEED for SPRING! What you NEED for SPRING! I always hate it when someone asks me "If there is only one thing you could have this spring, what would it be?" That is like buying a big bag of chips and eating just one!! It is such a difficult question to answer for any season. I most always answer the question with a very vague answer. And as for spring 2011, my answer is just as vague as ever. Anything in a bright but light color will be my must have this season. Does everyone know what I mean by that? 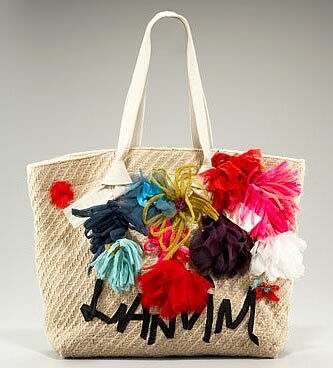 I knew this was "THE ONE" when I saw this Lanvin denim flowered tote. Magnificent! I am absolutely DYING over this bubble back tee shirt blouse by Jil Sander! Isn't it AMAZING?! 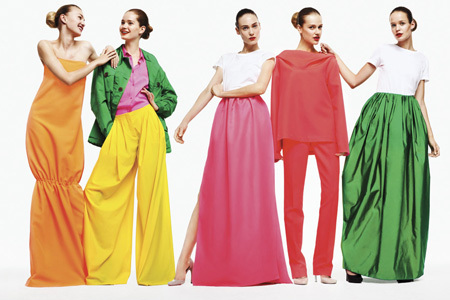 These looks from Jil Sander for spring 2011 make me feel so happy. I have a feeling that it has something to do with the COLORS. I just picked up this Revlon nail polish in "posh pink" today. It truly is the most perfect pink! This Stuart Weitzman ballet flat would look so cool with my black ankle jeans! This pink satin suit by Marc Jacobs just might be the one thing I would have to own for spring 2011.........if I could, I would.